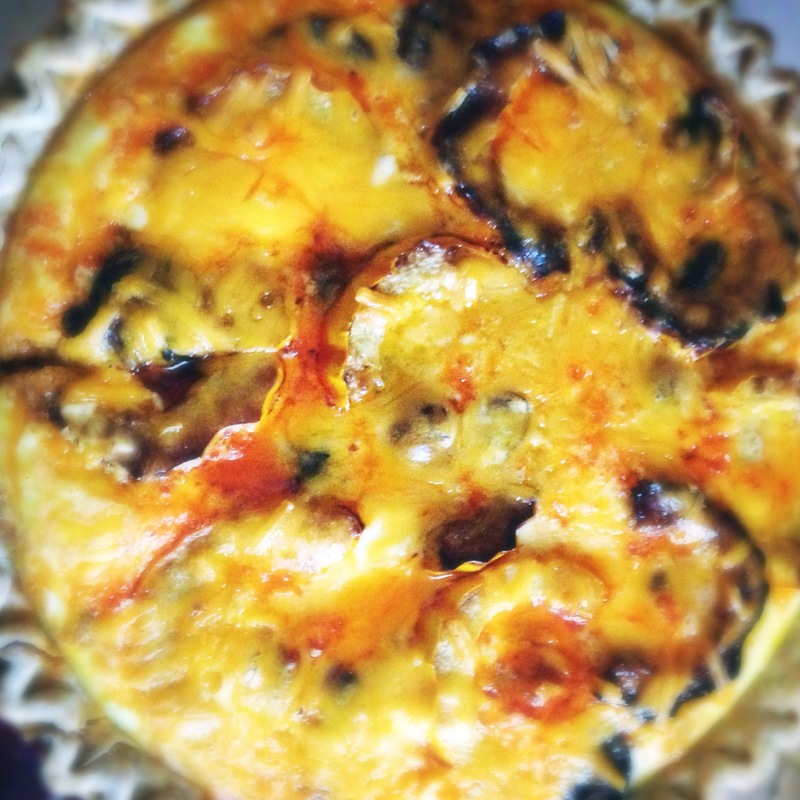 I love all types of quiches … my mother used to make great ones when I was a kid. We were always busy during the week, but often on the weekends, she would wake us up with the smell of ham and mushroom quiche, or sometimes one with spicy sausages and spinach. They would always be stuffed with lots of delicious things, and topped with tons of melty cheese. This is a great one using Autumn vegetables, and adding a little bit of spice. I used a vegetarian soy-rizo for this recipe to keep it meat-free, but feel free to substitute real beef or pork chorizo if you prefer. Just make sure it’s fully cooked before you put it in the oven. 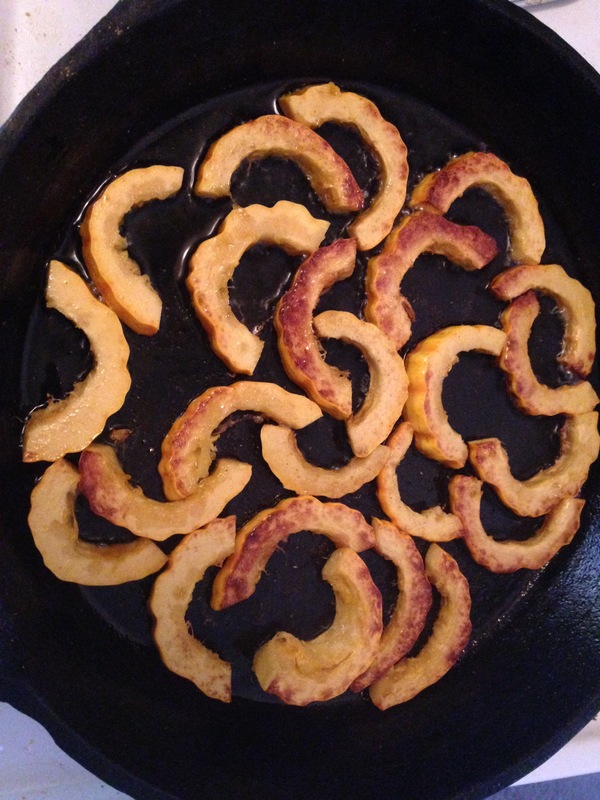 Brown the slices of squash in a cast-iron skillet and set aside. Scramble the eggs and milk together, and set aside. Preheat oven to 350 degrees. Heat the chorizo and potatoes together until fully cooked, then split the mixture between the two pie crusts. 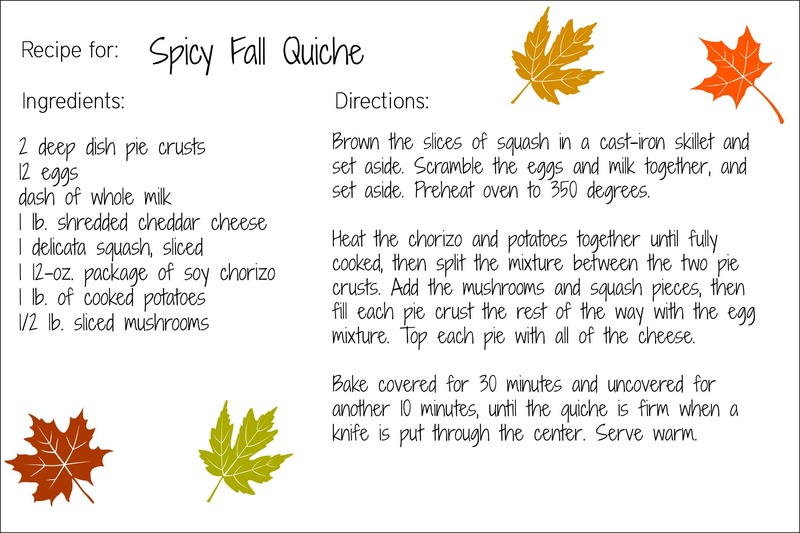 Add the mushrooms and squash pieces, then fill each pie crust the rest of the way with the egg mixture. Top each pie with all of the cheese. Bake covered for 30 minutes and uncovered for another 10 minutes, until the quiche is firm when a knife is put through the center. Serve warm. This entry was posted in condiments, cooking, food, holidays, leftovers, October Unprocessed, side dishes, snacks, Thanksgiving, Uncategorized, unprocessed, vegan, vegetarian. Bookmark the permalink. ← TBT: My first recipe video!